You are here: Home / Magic Love Bus Journey / Blast Off Party for the 2012 Magic Love Bus Journey and the LovEvoluton! 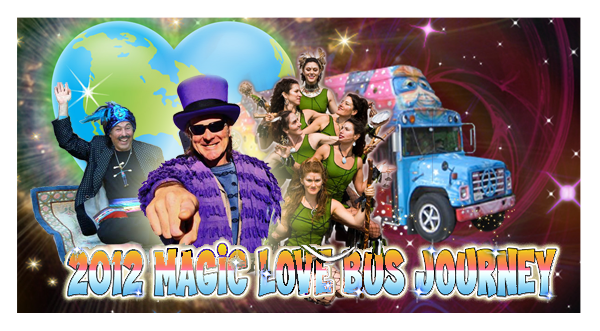 After months of preparation, the Magic Love Bus has been transformed into a rolling sound and light show. The bus is now a vehicle for heart based transformation and a platform for free expression. To raise energy and support for the 2012 Magic Love Bus Journey and the LovEvolution we hosted a “Blast Off Party” on Saturday, March 31st. Wow, what a blast off it was thanks to the amazing convergence of talented beautiful lovers who contributed their gifts freely to the LovEvolution. The Bus and it’s new crew of seven are fully energized and ready to blast out of the NIMBY warehouse and spread love and light all across America! To view the photo highlights visit the Blast Off Party highlights on the Magic Love Bus Journey website. Our next event is our Cast Off Ceremony at Ocean Beach on Saturday, April 14th from 3:30 to 9:30 pm. Come be the Magic! Our Mission is to co-create, unity, peace and understanding by bringing people of all colors, beliefs and economic status together on the Bus and online. As we cross America, we intend to share food, drumming, campfires, alternative movies, discussions, dancing, music and love and light. The bus will literally be a vehicle for heart based transformation and a platform for free expression. Together we can co-create a just and sustainable world.